Today, meet your guide at the arrival hall of Changsha Huanghua International Airport. Drive to visit Bamboo Slips Museum (closed on Monday). This museum has collected bamboo slips in the Three Kingdoms Period and Western Han Dynasty. It is the first museum to collects, protects, organizes, researches, and displays bamboo and wooden slips in China. Drive to Shaoshan to visit Former Residence of Mao Zedong, Statue of Mao Zedong Square and Mao's Family Ancestral Hall. After sightseeing, continue to drive to Fenghuang (Phoenix) Ancient City. An ordinary countryside house built with clay and wood. The furniture in the house is arranged as Chairman Mao lived here. The house was built in the late Qing dynasty (1644–1911). The building was the birthplace and childhood home of Mao Zedong, the first leader of the People's Republic of China. It is located in Xiangtan County of Hunan Province, located in the heart of Mao Zedong Memorial Hall and open before. Surrounded by pine bamboo trees, mountains arch protection. Tall bronze body statue, body robust, yet smiling and meditation, succeeded in shaping leaders at the founding ceremony of great style. Mao's Family Ancestral Hall is the general ancestral hall of Mao family in Shaoshan. It was first built in 1758, and the construction was finished in 1763. It is of the half-timbered structure. Grey bricks and tiles make the architecture full of classical feature. The hall is the best place to learn history and facts about the Mao's family and Mao Zedong. Located in Xiangxi Tujia and Miao Autonomous Prefecture, it is home to Miao and Tujia people. The city is famous for its ethnic cultural atmosphere, surrounding mountains, rivers and Tujia people's unique buildings. After breakfast, visit some museums, former residents of celebrities and some other historical sites in the ancient city. A short sampan ride in the Tuo River is included prior to driving to Zhangjiajie. After breakfast, take the world longest cableway to top of the Tianmenmountain. You will enjoy a hiking (about 1.5 hours) along the plank road and the famous glass sky walk built along the cliffs. 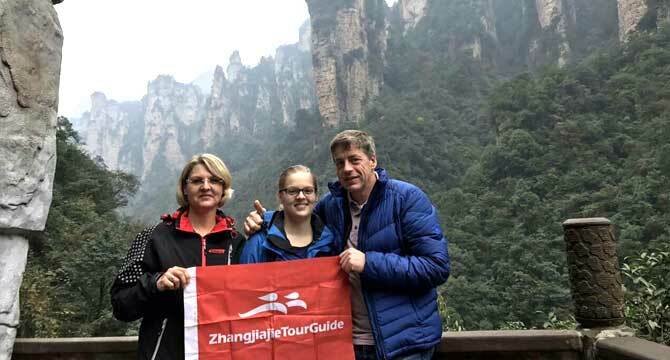 After the hiking, you will move to pay a visit to the Tiammen Temple and take the Forest Sightseeing cable car and back to the Tianmen Mountain cable car station and take the big cable car up to the middle station. And take a bus along the Tongtian Avenue (a famous mountain-winding highway in the world) to explore the Tianmen Cave. Later, move to enjoy a cruise on the beautiful Baofeng Lake. This glass walkway is located on the massive vertical cliffs of Tianmen Mountain, and rising 1,430 from the ground is a 60 meter long bridge constructed of 2.5-inch thick glass.Proceed to the main attractions of Tianmen Mountain, Tianmen Cave by Heaven-Linking Avenue. It is a natural water-eroded cave with the highest elevation in the world. It is actually a big hole in the mountain but people call it a cave and it has become a major attraction. Baofeng Lake is a rare high gorges lake and shaped by surrounding mountains into a narrow strip. Lying in mountains, the Baofeng Lake is filled by streams without pollution. The lake has a fascinating landscape with surrounding mountains and a mid-lake island. After breakfast, drive to Zhangjiajie National Forest Park. We will ascend the Yuanjiajie Mountain by the Bailong Elevator - a glass elevator built into the side of the mountain. On the summit, take about 2.5 hours to discover the Pillar of the Southern Sky. It was used to inspiration for the famous "Hallelujah Mountains" in Blockbuster's movie, Avatar. Move to the Platform of Forgetfulness to enjoy the nearby peak views and then walk across the No. 1 Bridge under Heaven. After lunch, climb up the beautiful Tianzi Mountain Nature Reserve to visit the Helong Park and so on. Later, take a cable car down the mountain to visit the dreamlike fairyland – Ten-mile Natural Gallery (mini-train is optional) and Golden Whip Stream. After breakfast, drive to Changsha to visit Orange Isle and Ancient Well of White Sand. It’s a beautiful isle in the Xiang River. Measured 5000 meters in length and 145 meters in width, it has more 1600 years old history and now, there are still about 5000 people live here. The typical products here is delicious orange, hence the name. From 1911 to 1949, many foreign embassies and consulates were built on the isle. During Mao Zedong's early years, he lived in Changsha. He and his friends He Shuheng, Xiao Zisheng, Cai Hesen, Xiao San and Xiang Jingyu would swim in the Xiang River. Since the 2010s, the Orange Isle Music Festival has been hosted on the isle. On December 20, 2009, the Youth Mao Zedong Statue was built on the isle. This manhole is located in Changsha City Huilong Mountain West, springs from the bottom hole flowing out, clear and transparent. After breakfast, drive to visit Hunan Embroidery Museum of China. Hunan embroidery is one of China’s famous styles of embroidery with a history over 2000 years. You can learn a lot about this famous embroidery in this museum. Then move to visit Huangxing Road - the biggest shopping area in Changsha. Conclude the tour with a transfer to Changsha Huanghua International Airport.